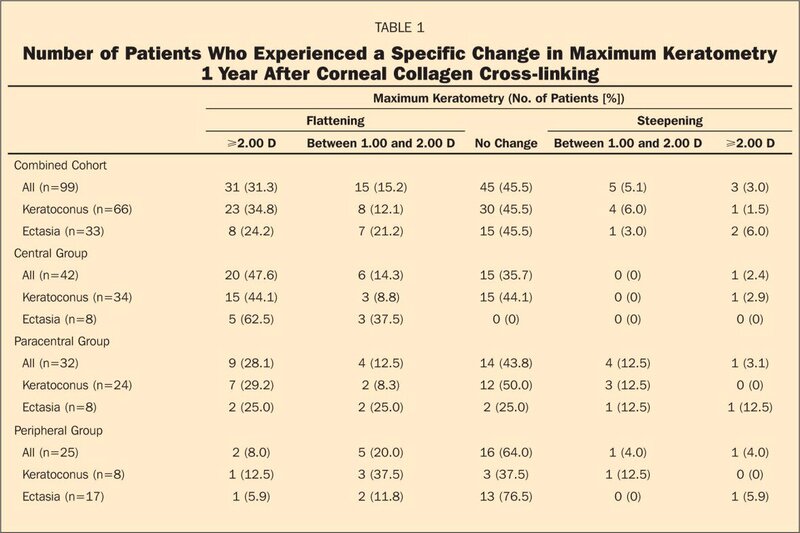 To assess the effect of preoperative topographic cone location on 1-year outcomes of corneal collagen cross-linking (CXL). In this prospective, randomized, controlled clinical trial, 99 eyes (66 keratoconus, 33 ectasia) from 76 patients underwent CXL. Cone location was defined by the coordinates of preoperative maximum keratometry (maximum K) using the anterior sagittal curvature topography map (Pentacam, Oculus Optikgeräte GmbH). Patients were divided into three groups: those with a maximum K located within the central 3-mm (central cone group), 3- to 5-mm (paracentral cone group), and outside the 5-mm (peripheral cone group) optical zones. Topography and visual acuity data were obtained preoperatively and at 1 year. In the combined cohort, maximum K and uncorrected and corrected distance visual acuity significantly improved by −1.60±3.40 diopters (D) (P<.001), −0.08±0.25 logMAR (P=.001), and −0.10±0.18 log-MAR (P<.001), respectively. Comparing cone groups, maximum K decreased by 2.60±4.50 D (P<.001) in the central cone group, 1.10±2.50 D (P=.02) in the paracentral cone group, and 0.40±1.20 D (P=.08) in the peripheral cone group. Differences among groups were statistically significant (P<.001). Uncorrected distance visual acuity improved by −0.07±0.3 logMAR (P=.1) (central cone group), −0.1±0.17 logMAR (P=.004) (paracentral cone group), and −0.1±0.25 logMAR (P=.04) (peripheral cone group). Corrected distance visual acuity improved by −0.14±0.21 logMAR (P<.001) (central cone group), −0.08±0.17 logMAR (P=.01) (paracentral cone group), and −0.08±0.12 logMAR (P=.002) (peripheral cone group). For both UDVA and CDVA outcomes, these differences among groups were not statistically significant. From Cornea and Laser Eye Institute-Hersh Vision Group, CLEI Center for Keratoconus (Hersh, Greenstein, Fry), Teaneck; and the Department of Ophthalmology, UMDNJ-New Jersey Medical School (Hersh, Greenstein), Newark, New Jersey. Dr Hersh is a medical monitor for Avedro Inc. The remaining authors have no financial or proprietary interest in the materials presented herein. Supported in part by Peschke Meditrade GmbH, Zurich, Switzerland; and an unrestricted grant to the Department of Ophthalmology from Research to Prevent Blindness Inc, New York, New York. Specific predictors of CXL outcomes remain to be defined. In particular, the influences of corneal architectural characteristics and topography patterns on the results of CXL have not been explored. Because the effect of CXL is thought to be biomechanical, the initial corneal shape may be important to the ultimate effect of the treatment. In our current study, we look at the possible influence of preoperative topographic cone location on outcomes of CXL including maximum K, CDVA, and UDVA. Patients with progressive keratoconus and ectasia after LASIK were enrolled as part of a multicenter, prospective, randomized, controlled clinical trial ( ClinicalTrials.gov; NCT00647699 & NCT00674661). This study was approved and monitored by an investigational review board and was HIPAA compliant. Informed consent was obtained from all patients. The study was conducted at a subspecialty cornea and refractive surgery practice to which keratoconus and postoperative LASIK ectasia patients were referred. Sixty-six eyes had keratoconus and 33 had ectasia (treated fellow eyes were also included in this analysis). Randomization was computer generated and on the day of the procedure a sealed envelope was opened revealing whether the eye would be in the control or treatment group. Patients were aware of their randomly assigned group. Inclusion criteria were patients aged 14 years or older and axial topography consistent with keratoconus or corneal ectasia. Progressive keratoconus or ectasia was defined as one or more of the following changes over a period of 24 months: an increase of ⩾1.00 D in the steepest keratometry, an increase of ⩾1.00 D in manifest cylinder, or an increase of ⩾0.50 D in manifest refraction spherical equivalent. Exclusion criteria were patients with a history of corneal surgery (except for LASIK), chemical injury, delayed epithelial healing, and corneal thickness <300 μm. The treatment group received ultraviolet A (UVA)/0.1% riboflavin ophthalmic solution therapy. Collagen cross-linking was performed according to the methodology described by Wollensak et al.1 A topical anesthetic was administered and the central 9-mm epithelium was removed by mechanical debridement. Riboflavin (0.1% in 20% dextran T500 solution [Medio Cross; Peschke Meditrade GmbH, Zurich, Switzerland]) was administered topically every 2 minutes for a total of 30 minutes. Following riboflavin administration, riboflavin absorption throughout the corneal stroma and anterior chamber was confirmed on slit-lamp examination. Ultrasonic pachymetry was performed and if the cornea was <400 μm, hypotonic riboflavin (0.1% in sterile water) was administered one drop every 10 seconds for 2 minutes. Ultrasonic pachymetry was performed to confirm that the stroma had swollen to ⩾400 μm. This was repeated until adequate corneal thickness had been obtained. The cornea was exposed to UVA 365-nm light (UV-X System; IROC AG, Zurich, Switzerland) for 30 minutes at an irradiance of 3.0 mW/cm2. An exposure diameter of 9.0 mm was used. During UVA exposure, isotonic riboflavin drops were continued every 2 minutes. Postoperatively, antibiotic and corticosteroid drops were administered and a therapeutic soft contact lens (Acuvue Oasys; Vistakon, Jacksonville, Florida) was placed. The contact lens was removed after epithelial healing 3 to 5 days postoperatively. Antibiotic drops were continued for 1 week and corticosteroid drops were continued for 2 weeks. Topography measurements were obtained using the Pentacam (Oculus Optikgeräte GmbH, Wetzlar, Germany). Preoperative cone location, defined by the Pentacam coordinates of maximum K, were divided into three groups: those eyes in which the maximum K was located in the central 3-mm optical zone (central cone group), 3- to 5-mm optical zone (paracentral cone group), and outside the central 5-mm optical zone (peripheral cone group) (Fig 1). Maximum K data were obtained preoperatively and at 1 year postoperatively. Figure 1. Pentacam sagittal curvature map. Cone location was defined by the Pentacam coordinates of maximum keratometry (maximum K). Cones were divided into three groups: those in which the maximum K was located in the central 3-mm optical zone, in the 3- to 5-mm optical zone, and located outside of the central 5-mm optical zone. Uncorrected distance visual acuity and CDVA were measured preoperatively and at 1 year. Visual acuity measurements were obtained under controlled lighting conditions using a modified Lighthouse ETDRS visual acuity test (2nd edition) with Sloan letters. Patients were tested at a 4-m distance from the visual acuity chart. If patients could not read any letters at 4 m, they were tested at a 2-m distance. Analysis was completed using PASW Statistics 18 (SPSS Inc, Chicago, Illinois). An analysis of variance (ANOVA) test was performed to compare measurement data among the three cone location groups. A paired two-tailed Student t test was performed to analyze the postoperative changes compared to baseline within the three groups. An additional analysis was performed to analyze the effect of preoperative cone location within the keratoconus and ectasia subgroups individually. This analysis was only performed on maximum K, because only this outcome parameter was found to be statistically significant among groups in the primary analysis. To increase the statistical power of this analysis, patients were pooled into two groups within the keratoconus and ectasia subgroups. In the keratoconus subgroup, 8 of 66 eyes had cones located outside the central 5-mm optical zone. Therefore, these eyes were combined with the paracentral cone group, leaving two keratoconus subgroups: those eyes with a maximum K located in the central 3-mm optical zone (n=34) and eyes with a maximum K located outside the central 3-mm optical zone (n=32). From the ectasia subgroup, 8 of 33 eyes had cones located in the central 3-mm optical zone and 8 eyes had cones located in the 3- to 5-mm optical zone. Therefore, these two groups were combined, leaving two ectasia subgroups: those eyes with a maximum K located in the central 5-mm optical zone (n=16) and those eyes with a maximum K located outside the central 5-mm optical zone (n=17). Within the keratoconus and ectasia subgroups, an independent t test was performed to compare the 1-year measurement data of the two cone location groups. P⩽.05 was considered statistically significant. Ninety-nine eyes from 76 patients underwent CXL and were followed for 1 year. Forty-two eyes (34 keratoconus, 8 ectasia), 32 eyes (24 keratoconus, 8 ectasia), and 25 eyes (8 keratoconus, 17 ectasia) had cone location in the central 3-mm optical zone (central cone group), 3- to 5-mm optical zone (paracentral cone group), and outside the central 5-mm optical zone (peripheral cone group), respectively (Fig 2). Figure 2. 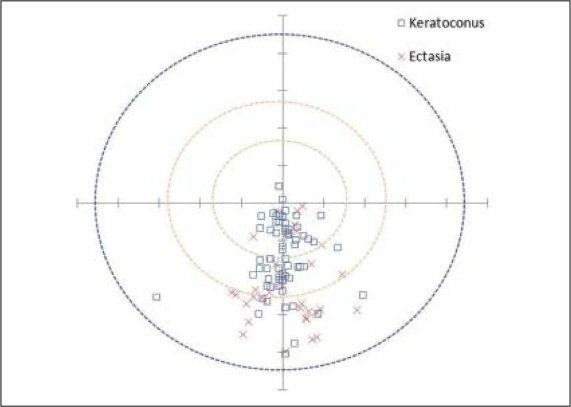 Scatterplot of the cone locations of individual patients with keratoconus and ectasia. Cartesian (x,y) coordinates were generated from the Pentacam. The circles define the cone location groups. The inner, middle, and outer circles represent the central (<3 mm), paracentral (3 to 5 mm), and peripheral (>5 mm) cone locations, respectively. Mean change in maximum K is illustrated in Figure 3. Figure 3. A) Mean change in maximum keratometry between baseline and 1 year in each cone location group. B) The 1-year change in maximum keratometry experienced by individual patients. At the bottom of each bar is the percentage of patients who experienced ⩾2.00 D of improvement, and at the top of each bar is the percentage of patients who experienced ⩾2.00 D of worsening. Combined Cohort. Mean preoperative maximum K was 58.00±9.40 D. At 1 year, maximum K significantly decreased by 1.60 D to 56.40±8.10 D (P<.001). Central Cone Group. Mean preoperative maximum K was 62.70±10.80 D. At 1 year, maximum K significantly decreased by 2.60 D to 60.10±9.40 D (P<.001). Paracentral Cone Group. Mean preoperative maximum K was 56.40±7.20 D. At 1 year, maximum K significantly decreased by 1.10 D to 55.30±6.60 D (P=.02). Peripheral Cone Group. Preoperative maximum K was 52.10±4.00 D. At 1 year, maximum K decreased by 0.40 D to 51.70±3.60 D. This change did not reach statistical significance (P=.08). Comparing the 1-year change in maximum K amongst the cone location groups, a significant difference was noted among all three groups (PANOVA=.02). Specifically, a significant difference was noted between the central and peripheral cone groups (P=.03). The differences between the central and paracentral cone groups (P=.1) and paracentral and peripheral cone groups (P=.7) did not reach statistical significance. Individual maximum keratometry data are reported in Table 1. Mean changes in UDVA are shown in Figure 4A. Figure 4. 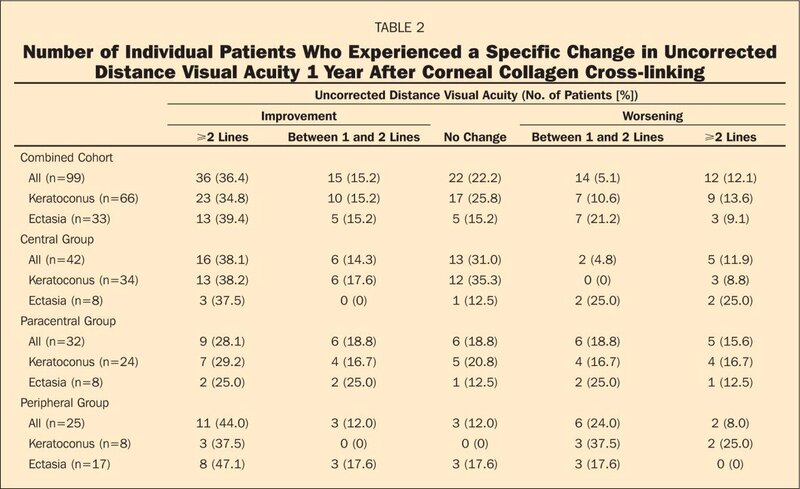 A) Mean logMAR change in visual acuity between baseline and 1 year, in each cone location group (UDVA = uncorrected distance visual acuity, CDVA = corrected distance visual acuity). B) The 1-year change in uncorrected distance visual acuity experienced by individual patients. At the bottom of each bar is the percentage of patients who experienced ⩾2 Snellen lines of improvement, and at the top of each bar is the percentage of patients who experienced a loss of ⩾2 Snellen lines. 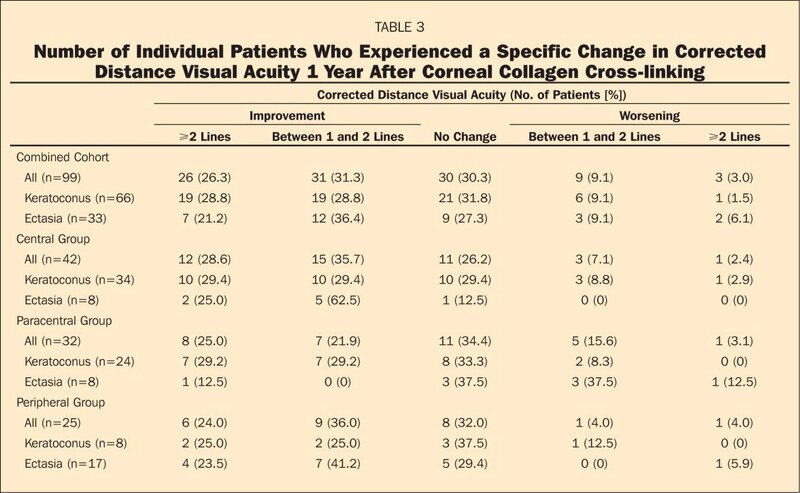 C) The 1-year change in corrected distance visual acuity experienced by individual patients. At the bottom of each bar is the percentage of patients who experienced ⩾2 Snellen lines of improvement and at the top of each bar is the percentage of patients who experienced a loss of ⩾2 Snellen lines. Combined Cohort. Preoperative UDVA was 0.80±0.34 logMAR (20/126 Snellen). At 1 year, UDVA significantly improved to 0.71±0.39 logMAR (20/103 Snellen) (P=.001). Central Cone Group. Preoperative UDVA was 0.88±0.38 logMAR (20/152 Snellen). At 1 year, UDVA improved to 0.81±0.43 logMAR (20/132 Snellen), but this change was not statistically significant (P=.2). Paracentral Cone Group. Preoperative UDVA was 0.72±0.34 logMAR (20/105 Snellen). At 1 year, UDVA significantly improved to 0.63±0.35 logMAR (20/85 Snellen) (P=.004). Peripheral Cone Group. Preoperative UDVA was 0.74±0.27 logMAR (20/110 Snellen). At 1 year, UDVA significantly improved to 0.63±0.32 logMAR (20/85 Snellen) (P=.04). Comparing the 1-year change in UDVA amongst the cone location subgroups, no significant was difference found (PANOVA-UDVA=.8). Individual UDVA data are reported in Table 2 and Figure 4B. Mean changes in CDVA are shown in Figure 4A. Combined Cohort. Preoperative CDVA was 0.33±0.24 logMAR (20/43 Snellen). At 1 year, CDVA significantly improved to 0.23±0.21 logMAR (20/34 Snellen) (P<.001). Central Cone Group. Preoperative CDVA was 0.43±0.29 logMAR (20/54 Snellen). At 1 year, CDVA significantly improved to 0.29±0.26 logMAR (20/39 Snellen) (P<.001). Paracentral Cone Group. Preoperative CDVA was 0.27±0.18 logMAR (20/37 Snellen). At 1 year, CDVA significantly improved to 0.19±0.13 logMAR (20/31 Snellen) (P=.01). Peripheral Cone Group. Preoperative CDVA was 0.26±0.15 logMAR (20/37 Snellen). At 1 year, CDVA significantly improved to 0.18±0.15 logMAR (20/30 Snellen) (P=.002). Comparing the 1-year change in CDVA amongst the cone location subgroups, no significant difference was found (PANOVA-CDVA=.3). Individual CDVA data are reported in Table 3 and Figure 4C. Preoperative and 1-year postoperative topography and visual acuity data for the keratoconus and ectasia subgroups are reported in Table 4. As described in the statistical analysis, the distribution of cone location was different in the keratocounus and ectasia subgroups—maximum K tended to be more central in the keratoconus than ectasia subgroup (see Fig 2). 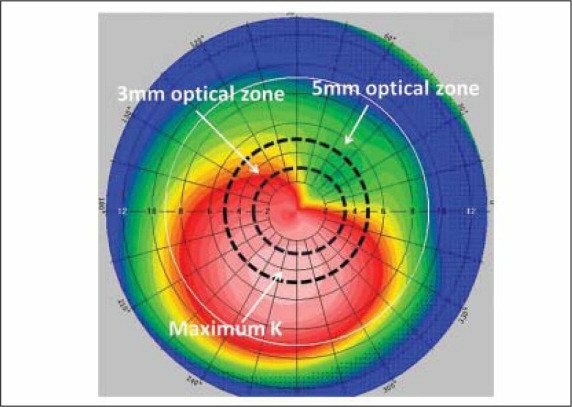 Therefore, within the keratatoconus subgroup, an additional analysis was performed comparing the change in maximum K in the central cone group (n=34) with the change in a combined paracentral and peripheral cone group, ie, all eyes with maximum K peripheral to the 3-mm zone (n=32). In this comparison, maximum K flattened by 2.70±5.00 D (P=.003) and 0.90±1.80 D (P=.005) in the central and combined peripheral cone groups, respectively. 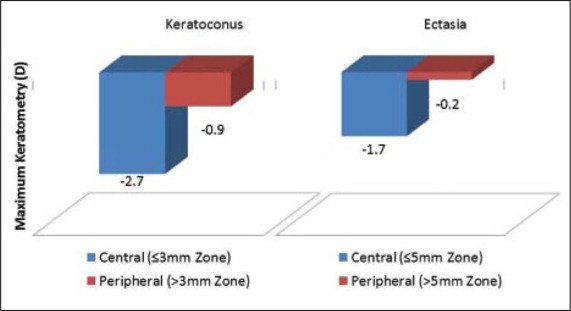 This difference in maximum K flattening, comparing the two cone location groups in keratoconus eyes, was statistically significant (Pcentral vs peripheral=.05) (Fig 5). Figure 5. Mean change in maximum keratometry between baseline and 1 year in each cone location group. In a similar analysis of the ectasia subgroup, maximum K significantly flattened by 1.70±2.70 D (P=.03) in those eyes with cones located in the central 5-mm optical zone (n=16), but only by 0.20±1.10 D (P=.4) in those eyes with peripheral cones (n=17). The difference in maximum K flattening, comparing the two cone location groups in ectasia eyes, was statistically significant (Pcentral vs peripheral=.04) (see Fig 5). Corneal collagen CXL is a promising new treatment for keratoconus and corneal ectasia. In our study of 1-year CXL outcomes, patients experienced an average improvement in both CDVA (from 20/45 to 20/34) and UDVA (from 20/137 to 20/117).9 Maximum keratometry as measured by the Pentacam flattened by 1.70 D. Such improvements have been corroborated by a number of other studies.2,3,7–11,17 Similarly, in the study cohort presented herein, there was 1.60-D flattening of maximum K and a significant improvement of approximately 1 Snellen line in both UDVA and CDVA 1 year after CXL. Little is known about potential preoperative characteristics that may predict the effect of CXL therapy. Investigators have suggested that preoperative corneal steepness may be related to CXL efficacy.18 Multifactorial analysis by our group shows that both preoperative maximum K and CDVA may be independently associated with outcomes.19 As the optical effects of cross-linking are militated by changes in corneal biomechanics, we hypothesized that the initial corneal topography pattern may influence consequent clinical outcomes. Therefore, in our current study, we attempted to test this hypothesis by analyzing subgroups with regard to their baseline cone location, as measured by the location of maximum K on corneal topography analysis. It should be noted that because the Pentacam uses apex-based coordinates, the map center may be shifted toward the cone and may bias the measurement toward underestimating distance from the true geometric center of the cornea. We found more topographic flattening after CXL in eyes with centrally located cones. Thus, for both keratoconus and ectasia eyes, a more centrally located cone preoperatively was predictive of a more robust result from the CXL procedure. Despite these differences in topographic improvement after CXL, preoperative cone location did not appear to affect CDVA and UDVA outcomes. This latter finding may be influenced by the fact that the central cone group had worse vision and a higher maximum K at the outset. Thus, even a significant improvement in keratometry as compared to peripheral cones may not impact visual acuity greatly enough to demonstrate a statistical difference from the other subgroups. 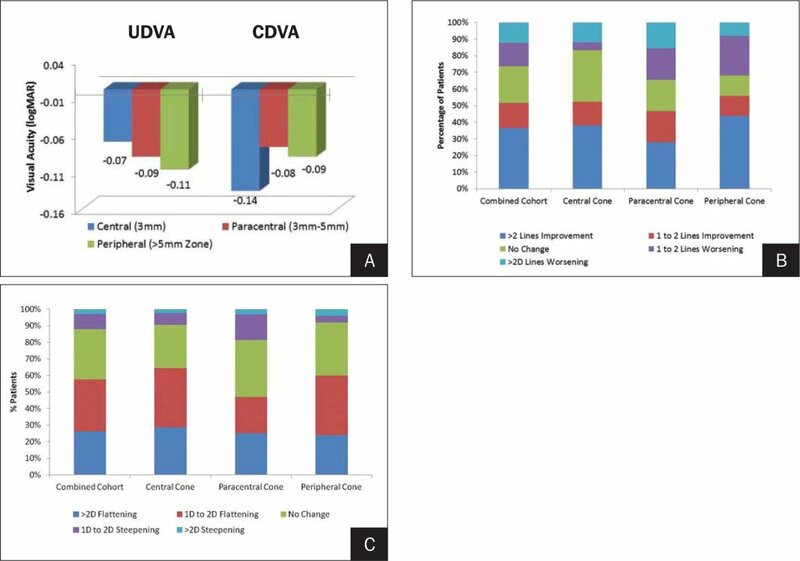 Although not statistically significant, a clinical trend was noted for a greater percentage of patients who lost UDVA in the paracentral and peripheral cone groups (Fig 4). Another study from our group19 has shown an independent association of preoperative maximum keratometry and CDVA on outcomes, but no influence of age, gender, pachymetry,14 postoperative haze,13 and other characteristics on postoperative results. In other analyses, we have demonstrated improvement in corneal topography indices20 and wavefront higher order aberrations21 after CXL. Theoretically, it may be possible that the biomechanical effect of cross-linking tends to make the cornea more symmetric, causing a peripheral cone to migrate more centrally; this may make the eye more myopic with consequent decrease in UDVA. Further investigation is necessary to explore these possibilities. The significant difference in topographic outcomes amongst cone location groups may be explained by a number of mechanisms. The treatment delivered by the current UV technique may not be homogeneous over the entire treatment zone.22 First, the energy profile of the incident UV energy may dissipate at the periphery of the beam. If the profile is not a “top-hat” of consistent power and more powerful centrally than peripherally, cones located in the mid-periphery or periphery will receive less cross-linking treatment with a less robust clinical response. Therefore, a UV light that delivers a more homogeneous treatment zone, center to periphery, may create a more consistent cross-linking response irrespective of cone location. Such devices are currently under development and clinical study. Second, the “cosine effect” may diminish the relative treatment of the peripheral cornea by CXL, even in the presence of homogeneous light energy. The mathematical basis of this effect is fully presented in our previous work analyzing the cause of spherical aberration after laser vision correction.23 In short, as the angle of incidence of the beam with the cornea decreases toward the periphery, secondary to the corneal curvature, the energy of the beam is projected over a larger area of the cornea. Consequently, less treatment ensues per unit area and more peripheral cones may receive less of a cross-linking response. The biomechanical mechanism of the CXL corneal response may also help explain our findings. In the CXL procedure, the reactive oxygen species produced from the interaction of riboflavin with UVA light (365 nm) ostensibly causes the formation of covalent bonds within and between collagen molecules, with consequent mechanical stiffening of the cornea.4,24 Hypothetically, a more symmetric cross-linking effect in centrally located cones may lead to more equal compression of collagen fibrils in all directions, and increase flattening in those patients with centrally located cones. Or it may be that there are inherent differences in corneal biomechanics for which cone location is simply an architectural proxy, differences which may militate or mitigate the cross-linking response. Aside from the immediate cross-linking effect, there appears to be a clinical wound-healing course that evolves over time. In a previous report of CXL-associated corneal haze, we have shown that corneas develop haze that maximizes at 1 month, plateaus at 3 months, and significantly decreases between 3 and 12 months postoperatively.13 It is possible that the nature and location of the cone affects the postoperative wound-healing course and ultimate clinical outcomes. As cone location tended to vary with the initial diagnosis of keratoconus or ectasia (the former with more central cones, and the latter with more peripheral cones, on average), it should be considered that our findings reflect an inherent difference in the CXL-response of keratoconus and ectasia as distinct disease entities, rather than an effect of preoperative cone location. It has been suggested that eyes with corneal ectasia have a less robust cross-linking effect than eyes with keratoconus. In our previous study, maximum keratometry flattened by 2.00 D in a keratoconus group, but by only 1.00 D in an ectasia group.9 An analysis was performed to address this possibility on the keratoconus and ectasia subgroups individually. In both the keratoconus and ectasia subgroups, significantly more topographic improvement was seen in centrally located cones. Therefore, it may be that the more robust CXL response in keratoconus versus ectasia, as observed in our previously reported results, is an effect of preoperative cone location rather than the preoperative disease diagnosis itself. 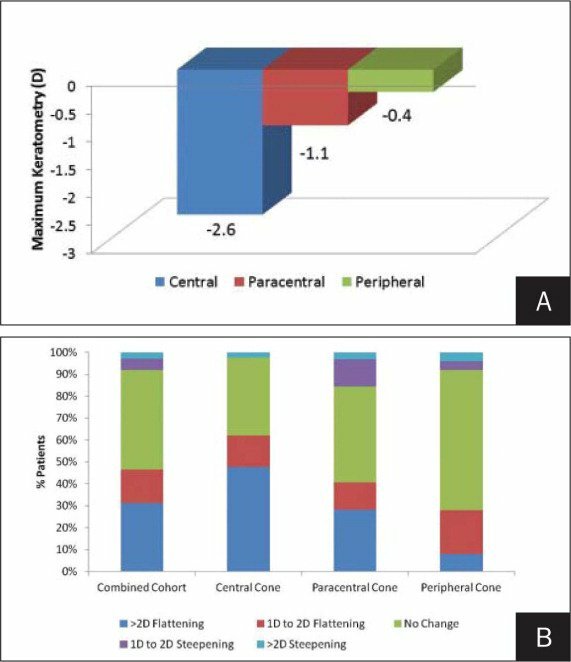 In our current study, there was a different mean pre-operative maximum K in the central, paracentral, and peripheral cone groups. Patients with centrally located cones had a steeper mean maximum K than those patients with more peripherally located cones. It has been suggested that there is an increased CXL failure rate in those patients with a steeper maximum K.15 However, more recent literature suggests that a preoperative maximum K >54.00 D is a preoperative predictor of CXL success.18 In current studies utilizing multifactorial analysis, we found that a higher maximum K preoperatively is independently associated with a great likelihood of more robust corneal flattening with CXL.19 Eyes with a preoperative maximum K ⩾55.00 D are 2.7 times more likely to flatten by ⩾2.00 D 1 year after CXL. Thus, the results presented herein could be explained simply by the central cones being steeper than the paracentral cones that were, in turn, steeper than the peripheral cones. Although the mechanism for the greater improvement of centrally located cones remains uncertain, the effect of preoperative cone location on CXL outcomes may be important as CXL continues to evolve as a clinically useful treatment. With regard to the delivery system, assuring consistent energy over the face of the beam may give more consistent treatment to the corneal periphery. Giving more treatment to the corneal periphery may account for the loss of treatment secondary to any cosine effect. Moreover, topographically guided treatments, either with the beam directed at the cone apex directly or delivered as a true topographically guided treatment, could improve CXL results independent of cone location. With regard to other procedures to enhance the cross-linking effect, efforts to “centralize” the cone preoperatively, for instance by intracorneal ring segments or conductive keratoplasty,25 may lead to more robust CXL results. In clinical practice, it is valuable to give the patient an idea of his potential outcome to afford proper expectations. Thus, it is helpful to look at the likelihood that an individual patient will improve or decline substantially. Individually, almost half of the patients in the central cone group experienced a flattening of ⩾2.00 D. Only 8% of patients in the peripheral group experienced a similar flattening. It is important to note that among all groups no mean progression of keratoconus or corneal ectasia occurred 1 year after CXL. Overall, 97.6% of patients in the central cone group, 84.4% of patients in the paracentral cone group, and 92% of patients in the peripheral cone group experienced either no topographic change or topographic flattening at 1 year. Clinical outcomes of CXL for the treatment of keratoconus and ectasia continue to be elucidated. As the use of this promising treatment continues to grow, it is important to begin to define in which patients CXL will be most successful. There appears to be increased topographic improvement in those patients with centrally located cones. Further study is underway to determine whether preoperative cone location affects other CXL outcomes and if CXL treatment should be more focused on preoperative cone location. Greenstein S, Hersh PS. A multifactorial treatment analysis and algorithm for corneal collagen cross-linking. http://www.arvo.org. Association for Research in Vision and Ophthalmology Web site. Accessed May 2012. Mrochen M, Bueeler M, Donitzky C, Seiler T. Optical ray tracing for the calculation of optimized corneal ablation profiles in refractive treatment planning. J Refract Surg. 2008;24(4):S446–S451.